Since so many of you enjoyed my last article on “How to Shop Like a Regency Era Gentleman,” I thought I’d tell you about a few more London shops that were selling goods back in the Regency era and are still open today. 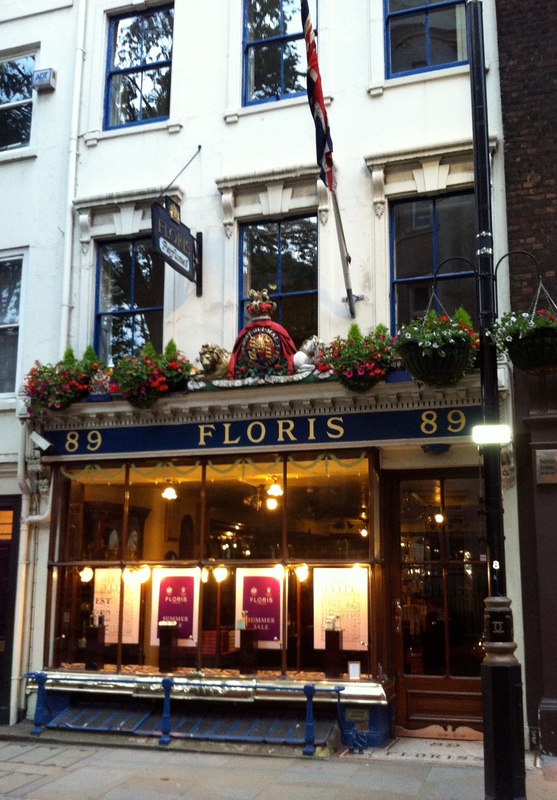 If you’re a person who loves a good scent, you should check out Floris London, located at 89 Jermyn Street. This perfume shop was founded in 1730 by Juan Famenias Floris and his wife Elizabeth, and it currently is still run by their descendants. Throughout the Georgian era, Floris created individual scents for their patrons and were known for their personal grooming supplies. In 1818, while living abroad, Mary Shelley wrote to her friend Thomas Love Peacock in London and asked him to send her “two hairbrushes and a small toothbrush” from Floris. In 1820, they received their first Royal Warrant as Smooth Pointed Comb Maker to King George IV. The first time I stepped into Floris, I was greeted by a helpful clerk behind the counter and was lucky enough to have the store to myself. While perusing their products through the wood and glass display cases that appear to be original, it was easy to imagine what a shopping experience might have been like for a Regency lady. Floris has products for men, women, and the home. If you’d like to try any of their products but can’t make it to London, you can order from Floris online. For the bluestockings among you, a short walk around the corner from Floris to 187 Piccadilly will take you to Hatchards booksellers. During the Regency era, wealthy men and women could pick up the latest editions from their favorite authors at Hatchards. 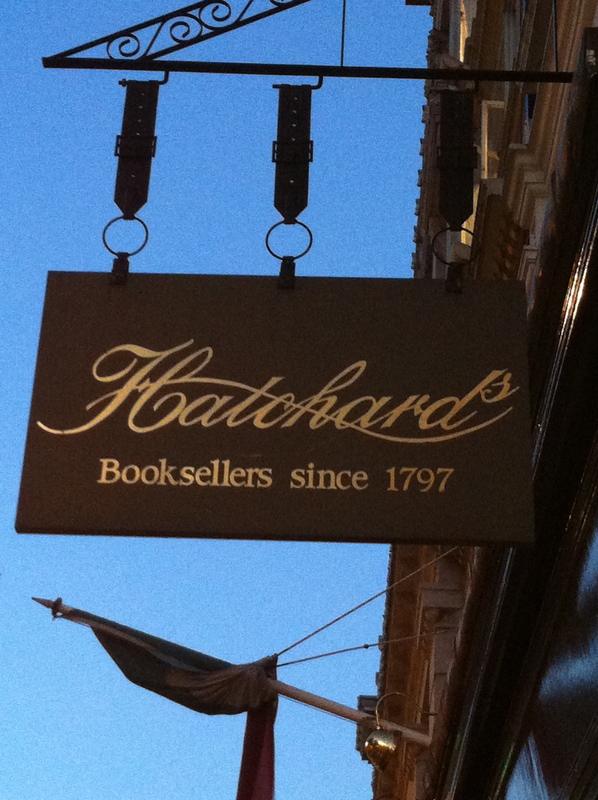 Nestled close to the popular shopping streets of the day, Hatchards is London’s oldest surviving bookshop. 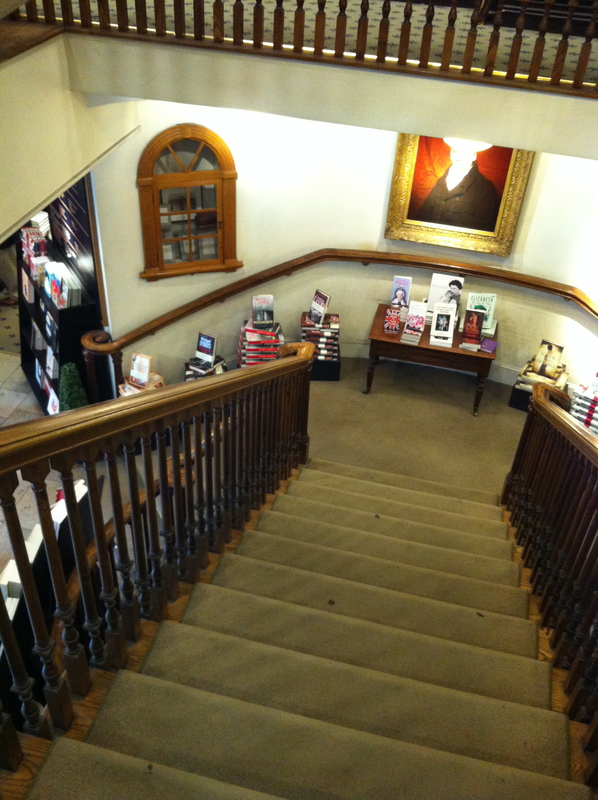 It was founded in 1797 by John Hatchard, and his portrait presides over the shop’s winding staircase that connects the five floors of books. I will admit, this is one of my favorite places in London, and it’s featured in two of the novels I’ve written. As you walk through the store, you’ll pass the original fireplaces, dark wood paneled walls and rooms crammed with books. I can easily spend an entire day here. If you’re the type to appreciate some quality name-dropping, Queen Charlotte, the Duke of Wellington, and Lord Byron are some of the famous people who have purchased books a Hatchards. Directly next to Hatchards is Fortnum & Mason, founded as a grocer in 1707 by Hugh Mason and William Fortnum. William was one of Queen Anne’s footmen and had the idea to sell the royal household’s half-used candles to make money. This is how Fortnum & Mason began. While the current building is not the original, the store has always been located at the corner of Duke Street and Piccadilly. 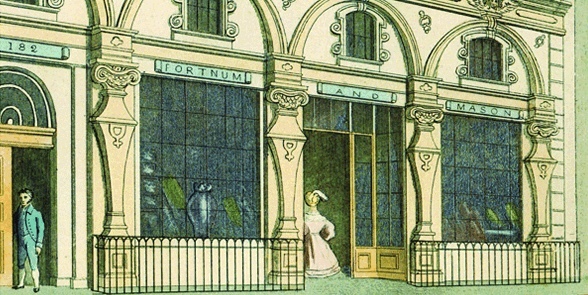 During the Regency era, Fortnum & Mason was known for food that was easily portable for long distance journeys. They also introduced ready-to-eat specialty items aimed at wealthy area residents. During the Napoleonic Wars, many officers ordered packaged supplies from Fortnum & Mason for a bit of comfort while out on their campaigns. These packages included tea, dried fruit, spices, and other preserves. And in 1814, the Earl of Egremont turned to Fortnum & Mason when he was entertaining the Czar of Russia. Today they are a renowned purveyor of fine food, hampers, tea, and wine. They have a number of restaurants and it’s a lovely place to go for tea. Speaking of tea, did you know that you can still buy tea in one of Jane Austen’s favorite tea shops? 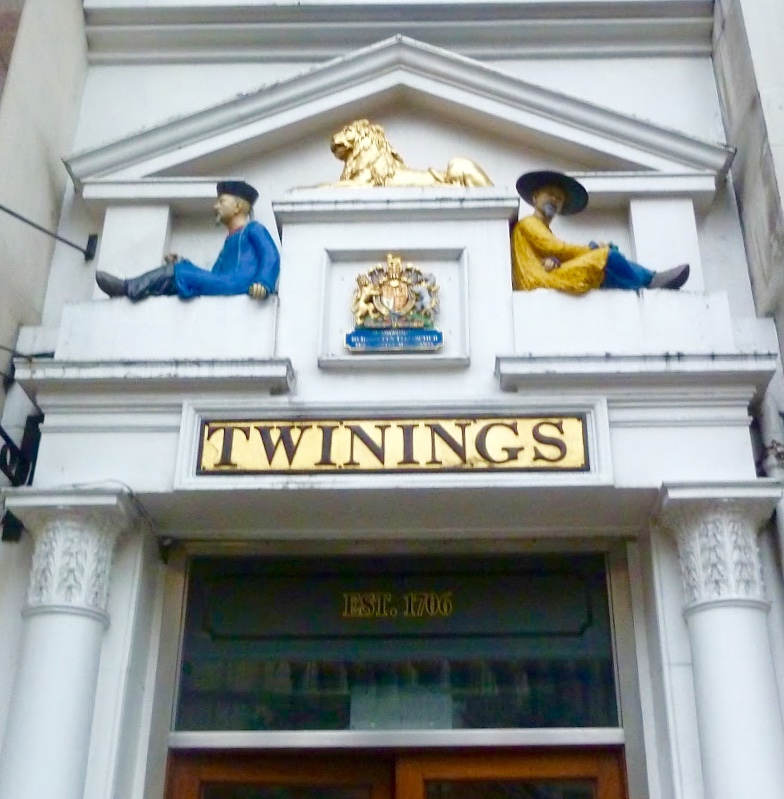 Although Twinings flagship store is located outside of Mayfair and St. James, the quality of the tea was so good, that it was worth the trip. 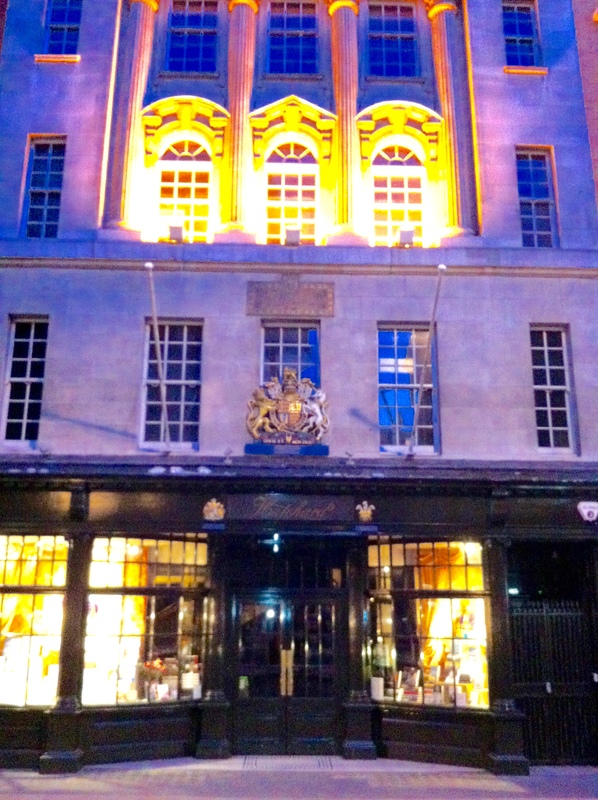 This shop was founded in 1706 and continues to occupy its original location at 216 Strand. Two Chinese men and a lion preside over the doorway just as they did in Jane Austen’s day. For the record, none of these stores contacted me to include them in this article. They just happen to be places I like to visit when I’m in London, and when I walk through these shops, I’m reminded that museums aren’t the only places you can visit to feel a sense of the past. Loved learning about the history of these stores, many of which I’ve been to as well! You spoiled me with our trip to the Met. After seeing a room in regency time I could imagine the men and women’s day. Thanks for sharing some fun places in London. I can imagine they must be loads of fun to write about after visiting. Yes indeed. How clever Fortnum & Mason were, selling food that was easily portable for long distance journeys. Georgians were on the move and needed to provide for themselves en route. Military officers to be sure but I imagine also people travelling between cities for business or pleasure. The horse and carriage would have gone over bumpy roads, in all sorts of weather, so some comfort food (and perhaps comfort reading) would have made the trip more less tedious. What a lovely shopping day you have given us. Thank you! I’m sending this to my niece who resides in London. If she hasn’t heard of this enchanting bookstore already, I know she will visit it posthaste!